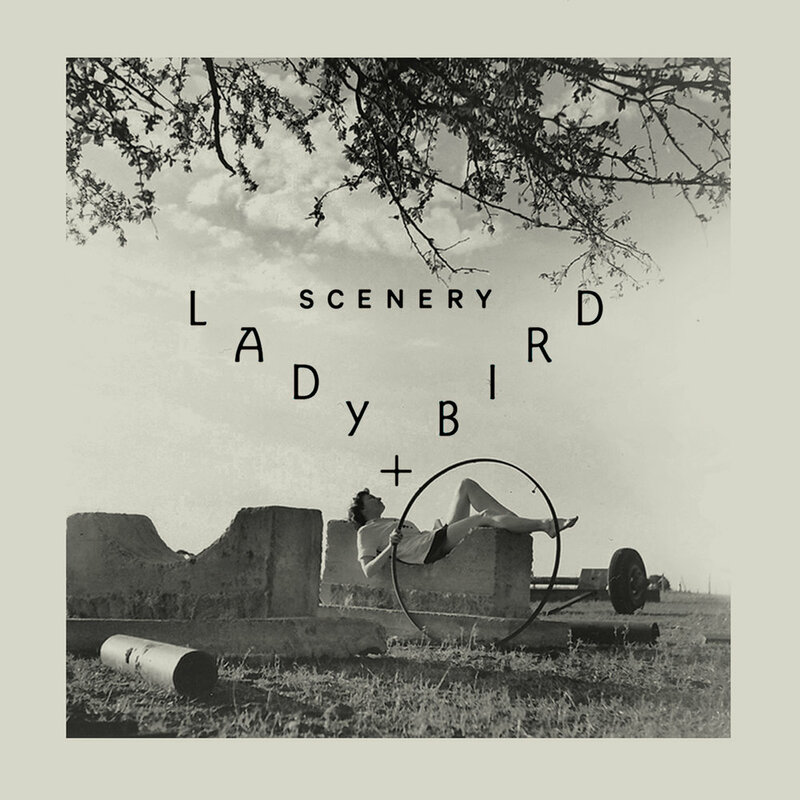 I'm very proud to present Scenery's Lady Bird Cassette. It's our first release since 2017's full length Two Stares. While the latter was a sweat-filled summer of partying, love, and loss, Lady Bird is a quieter, more intimate night on the lake. The album cover of this release is very special to me. 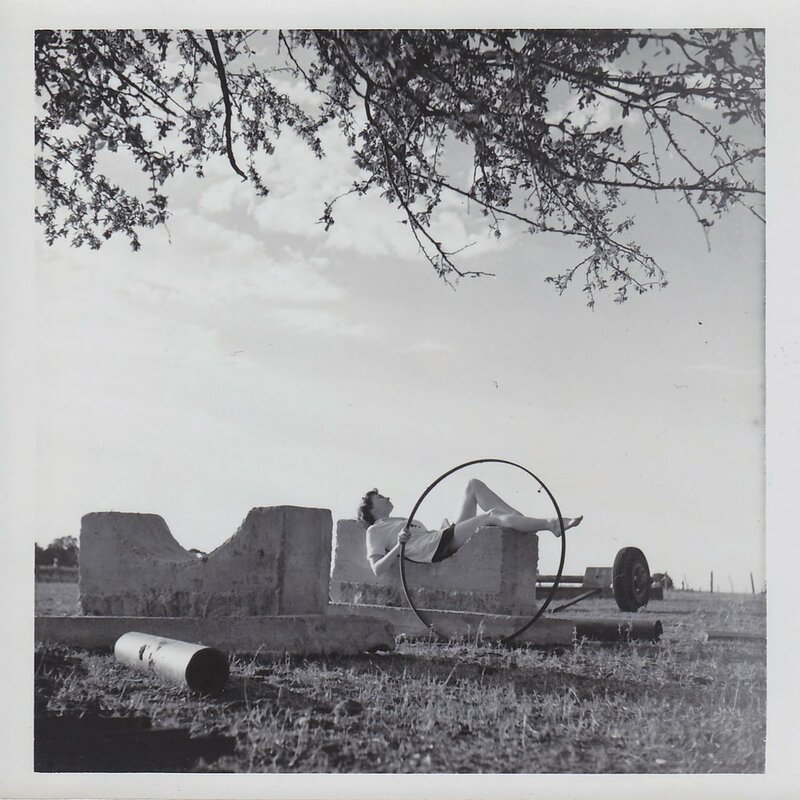 The photo was taken by my grand-uncle Roland Chatham in 1947. The subject was his girlfriend, my beloved Aunt Catherine, whom we lost in 2016. She was truly a Lady Bird, as she flew airplanes in WWII in an elite women's air group. I love how my talented friend, Bryan Butler, took the photo and brought it together perfectly. The title track, Lady Bird, is a story about falling in and out of love in Austin in the late 90s and early 2000s. Back then there used to be impromptu concerts in the middle of the Lamar Street pedestrian bridge. That's what I'm referring to in the chorus when I sing "Meet me on the bridge over Lady Bird and I'll sing you my song." It has since been pointed out to me that Austin's Town Lake wasn't renamed "Lady Bird Lake" until 2007. I think that really just speaks to how our memories and nostalgia can be so wildly approximate, with people, places, and times conflated into a single picture; a single feeling. That's what we tried to do with this song. The B-side, Queen of the Night, is also very special to me. When my good friend Elizabeth Lodowski passed away in 2016 her boyfriend gave one of the most moving eulogies I've ever heard. She wrestled with cancer for several years, but they only met a couple of years before she died. This is my best attempt of catching that moment and putting it into a song. This is the first album I've put out of my own music that I didn't play a large role in mixing since the passing of my best friend and partner in music, Travis Bannerman. Major props to John Michael Landon at Estuary Studios for mixing the two featured tracks with such skill and care. This was also the first time I've employed anyone for mastering except for Travis or the ever-so-talented Tim Gerron. Big shout out to Kevin Butler at Test Tube Audio for last-second mastering that was perfectly crisp and clean. You can listen below or on Spotify and you can purchase a physical cassette on our bandcamp site. This summer is turning out to be a busy one musically for yours truly. Check out my music page that has an up-to-date list of the places you can catch me play by myself or with my band Scenery. Several of them are FREE so I look forward to seeing you out and about! Scenery's TWO STARES now available everywhere! Scenery's first full-length album, Two Stares, is now available everywhere! You can order a physical CD here for just $10, or check out your favorite digital music service below. My band Scenery's latest single, Smoke & Mirrors, was KUTX's song of the day on Friday 12/2/16! My friends and I in Scenery are so excited to celebrate the release of our fist full-length album Two Stares on Jan 6th. We'll be partying this Saturday night 12/3 at Cheer Up Charlie's with our good friends in Good Field, Kady Rain, and Ronnie Heart performing. THIS SHOW IS FREE! Physical CD copies can be preordered here in December and will ship 1/2/17. But, of course, they will also be available at our live performances, including the 12/3/16 release party. Austin synth rock band Scenery is proud to announce the release of their first full-length album, Two Stares. It will be available the first week of 2017. Having been a band just under two years, this collection of Austin music veterans has already cultivated an avid following through their electric live performances. Scenery's back in action this week opening for the buzz band Day Wave. We play early at 8! New Music Video: Scenery - "For the Record"
You can view my band Scenery's new video here or on Facebook. We shot it with an Iphone 5 on the VHS Camp app. I edited it on Final Cut Pro using the multi-cam clip feature. Overall we spent about 10 hours and less than $20 on this gritty little piece. Enjoy! My newish band Scenery has released our second single, For the Record. It is available on Itunes, Spotify, Amazon Music, Apple Music and anywhere your ears care to consume. You can also listen to it by just clicking on the play button below. Several folks have asked me about the song's dark nature, and who I might have kissed in 1993 that would be giving me such present-day alcoholism. Well, in a dramatic departure from the overly heady and deeply spiritual music I have become known for, I have let my songwriting for Scenery be fictional, universal, and as sappy as Robert Smiths'. It has been a lot of fun. Seeing as I have never allowed myself to just write songs that weren't part of a concept album or meant to be sung in liturgical worship.... it's very refreshing. So hopefully you, or anyone, can find something you identify with enough to sing along or get down on the dancefloor. My newish band Scenery will be kicking off SXSW in style with The Shivery Shakes, Borrisokane and more on Friday 3/11 at The Mohawk in Austin. It's really a great bill of local talent. You can get tickets here. We can't wait to play some new material and dance our way into SXSW with each one of you! A new promo shot of Scenery, more to be released in coming weeks. Photo taken by Richard Kentopp. Scenery's new single Radio Beach is KUTX Austin 98.9's song of the day today. Check it out and download it for free. You can see Scenery play at the Mohawk in Austin, TX on Thursday July 16th with Poly Action and Volatile Colour. I've recently started a new band with my friends. We're called Scenery. We just put out our first single entitled Radio Beach. Please take a listen, and if you feel so inclined, please make it the Summer Jam of your 2015. You can listen and download for free at our bandcamp page.